Everyone can see the trends in the automotive industry by watching a car commercial. Gone are the days where buyers are excited about power windows and locks. Today, new buyers are excited about Bluetooth sound systems and lane assist technology. But what are some of the trends in Utah’s automotive dealership design we’ve seen at CMA? 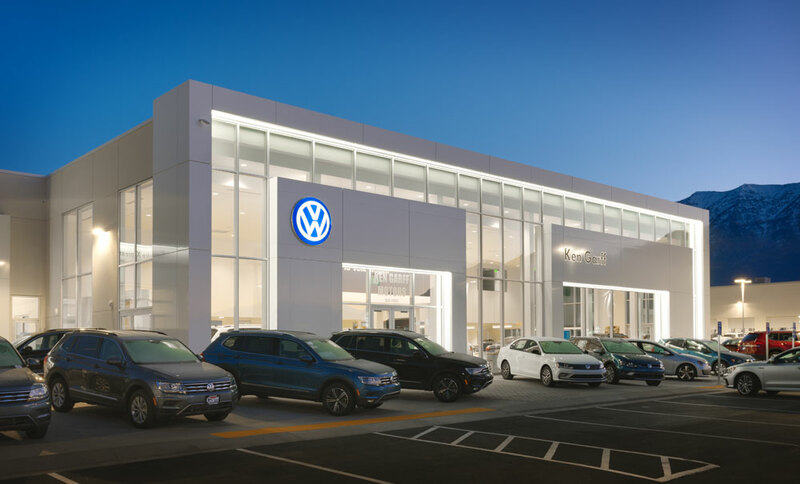 One big design trend is to use space around the dealership to make the customer experience as pleasant and comfortable as possible. With “customer touch points,” service technicians and salesmen have multiple settings in which they interface with clients. “These types of showrooms are focused on keeping the customer happy,” explains Gerrit Timmerman, lead principal for the automotive team. “They are designed to create a positive experience for the customer, so they keep coming back.” From the comfortable sofa where they can watch their favorite movie while snacking on popcorn to the well-lit and well-appointed showroom, these spaces are designed specifically to feel friendly and inviting. Customer touch points build customer loyalty: making the dealership so appealing that it’s the obvious choice for a service appointment and for the next car purchase. CMA worked with Ken Garff Honda Salt Lake City to transform their disjointed space into an open visual corridor with a customer theater room as the focal point. The showroom needs to be state of the art for the big-ticket items, but dealerships can also be very successful with vehicle services. Valuing the service staff with clean locker rooms, bright restrooms, and a beautiful, well-equipped and comfortable automotive shop is a great way to keep morale high and maximize employee retention. “We specified high speed doors at Ken Garff Chevrolet to help maintain a more consistent temperature,” explains Gerrit, “the technicians appreciate the cool air in the summer and heat in the winter.” More emphasis on the shop is great business for mechanics, and by extension, for dealerships. 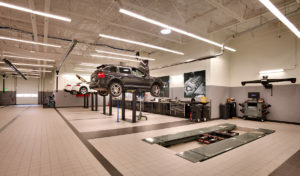 Skylights at the Porsche Audi service center in Lehi keep the space well-lit and inviting. Dealers are taking note of market trends as hybrids and electric cars become mainstays on today’s roads. Electronic volt (EV) chargers are appearing at dealerships all over. 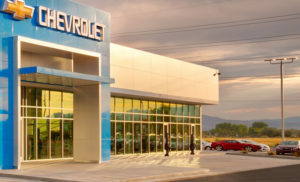 Dealerships charge electric cars during routine service, a “free” benefit for their client. “How does a dealer keep a customer for life?” says Gerrit, “If they have an EV charger at the dealership, a customer who is out and about may swing by for a charge because that is where they bought the car. It helps engender customer loyalty.” Some dealers are very progressive, doubling the amount of chargers they currently need to anticipate future demand. Two EV chargers, front and center at Ken Garff Chevrolet in American Fork. As energy costs go up, dealers are looking for ways to reduce their overhead. Solar panels on dealership roofs are becoming more common. Most dealerships are seeing large, upfront costs as a no-brainer when the long-term savings is so great. 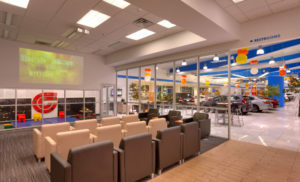 LED retrofits help dealers sell more cars, since brighter lights and prominent displays generate better sales. 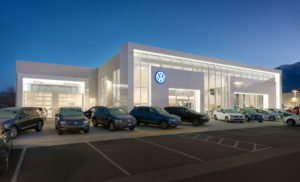 LED lighting at Ken Garff Volkswagen in Orem provides better illumination and reduced energy costs for the showroom.